Explore New Zealand's North Island with its unique 7 unique geographical regions and diverse natural beauty, from soaring mountain peaks, fiords, lakes, rivers, native rugged bush, the majestic volcanoes of the North Island's central plateau to the central North Island skifields of Whakapapa and Turoa by bus and coach from Kaitaia. 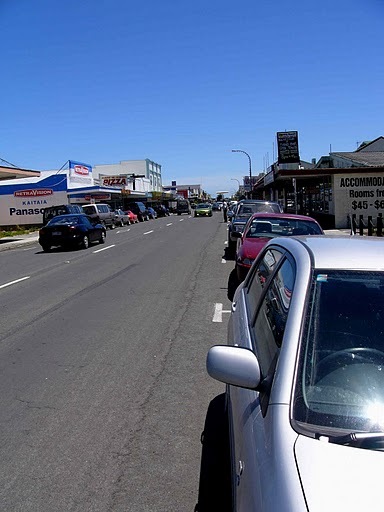 Kaitaia (Pop: 5202) is a town in the far north region of New Zealand, at the base of the Aupouri Peninsula which is about 160km northwest of Kaitaia and 330 kms north of Auckland. Kaitaia is a a farming town, it busily supports sheep farming, cattle and dairy farming, vineyards and fruit growing - especially avocados - as well as extensive supply industries. Kaitaia’s tradition of well established, old businesses is well known and the town is enriched with many old established families. Alongside good shopping, cafes and restaurants, Kaitaia has an indoor sports centre, facilities for bowls, golf, tennis & squash, a shooting range, a fine public library and a choice of schools. Sailing, surfing, surf casting at the breathtaking Ninety Mile Beach, diving and fishing, including the discipline of deep sea fishing - all are popular in the North. Regardless of the weather there is always a coast good for fishing – and the region possesses one of the most notable left hand surf breaks in the world. Kaitaia and surrounding areas are home to many skilled craftspeople working in wood, pottery, paint, glass, ceramics, flax, bone, and greenstone. Like most rural towns in New Zealand. Kaitaia has its very own annual Agricultural & Pastoral Show, well over a hundred years old and one of the oldest in New Zealand, a time when the community traditionally gathers to enjoy itself. From Kaitaia there is a range of tours for Cape Reinga via the 90 Mile Beach, gum field tours and Maori Culture tours. Travelling from Kaitaia is in modern buses and coaches with InterCity Coachlines operating a fleet of eco-friendly air conditioned buses with reclining seats and foot rests. Great Sights and Newmans Coachlines operate premier services using a fleet of modern eco-friendly air conditioned coaches featuring reclining seats with foot and head rests and onboard toilet/washroom facilities. InterCity Coachlines operates the Starlighter overnight bus service between Auckland, Hamilton, Rotorua, Taupo, Palmerston North and Wellington or vice versa, connecting at Wellington with Cook Strait ferry services from Wellington to Picton between the North and South Islands. The Starlighter service features reclining seats with foot and head rests, individual reading lights and air conditioning controls, onboard toilet/washroom facility and makes two refreshment/comfort stops on route. If you want to explore and see New Zealand's unique scenic beauty from Kaitaia, there are a range of flexible 'Book As You Go' bus, scenic coach, ferry travel and sightseeing passes giving you value for money travel.